German Auto Body serves all makes and models including extensive knowledge of German cars such as Porsche and BMW. Anything your car needs, we can do. Our services extend from minor to heavy collision repair, vehicle customization, to extensive restoration of classic or rare vehicles. We have NO contract with insurance companies! This means we perform to our high quality standards rather than abiding to that of insurance companies’. Each aspect of our car service is done to a level above and beyond the competition. Instead of applying auto body fillers to dings and dents, we use metal finishing. Instead of ordering a substandard replacement part, we use our extensive network of industry leaders to find original parts for your vehicle. Today, many technicians would settle for simply repairing the visible flaws in a vehicle after an accident. We go beyond this step to restore external, internal, and operational features of your vehicle back to its factory condition. Our shop has won several awards for the quality of our paint application and we are proud to say that our paint will outlast that of the factories. Our paint department has a state-of-the-art spray booth where we only use Glasurit paint. Glasurit is top-of-the-line paint and factory approved paint from Porsche. With our paint specialists, we will color match your vehicle’s original paint and you will be surprised as to how well we do it. We take Classic Porsche Restoration seriously. You can trust German Auto Body to restore your classic Porsche to your specific needs. Not only do we offer this service, we specialize in it. 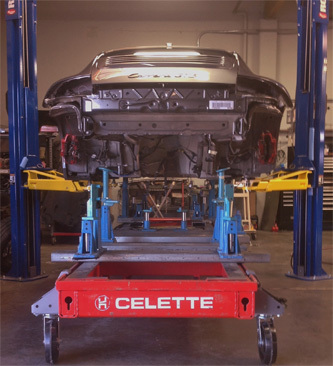 Our certified Porsche experts always provide the highest quality of work anywhere. Let’s talk about your beautiful classic Porsche today.